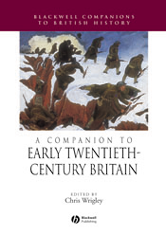 This Companion brings together new essays by leading historians to provide a reassessment of British history in the early twentieth century. The contributors present lucid introductions to the literature and debates on major aspects of the political, social and economic history of Britain between 1900 and 1939. Examines controversial issues over the social impact of the First World War, especially on women. Provides substantial coverage of changes in Wales, Scotland and Ireland as well as in England.